Drug testing is a common laboratory procedure for detecting the presence or measuring the levels of drugs within the body. Drug testing can identify individuals using illegal or prescription drugs. The information may be used to identify a possible drug dependency, help diagnosticians in handling medical cases or aid employers or parents in screening employees or children. There are a number of drug test techniques, each with own their advantages and disadvantages. A common drug-testing technique is urine testing, which checks for the presence of drugs or drug metabolites within the urine. This technique is widely used to screen for individuals using opiates or illegal drugs like cocaine, marijuana, phencyclidine (PCP), methamphetamine, methadone or benzodiazepines, reports the Medical College of Wisconsin. Urine sample testing is a noninvasive and relatively simple drug-testing method, but it has a number of drawbacks. While a urine test can check for the presence of drugs within the urine, the laboratory results do not indicate the levels of the drug present and may not detect drugs a week after use. The urine test may also result in false positives for some drugs, as the test cannot differentiate between naturally-occurring opioids in the body or opiate drug use. Urine tests that are positive for opiates require additional testing to confirm drug use. Another type of minimally invasive drug test is a hair test. Hair drug testing is routinely used to check for illegal drug use, such as cocaine, marijuana, amphetamines, opiates and PCP. Each hair follicle has a rich blood vessel source that nourishes the cells responsible for hair growth. When an individual is exposed to drugs, drugs or drug metabolites diffuse from the blood into the hair follicle, so traces of them may be detected in the hair. Since hair growth is an ongoing, long-term process, hair drug testing proves useful in detecting drug use long after drug exposure. NORML, the National Organization for the Reform of Marijuana Laws, indicates that drug sensitivity can vary based on ethnicity as well as environmental factors that affect the hair. Another common type of drug test is a blood test. Although a blood test is more invasive than a urine or hair test, it provides more information about drug use. 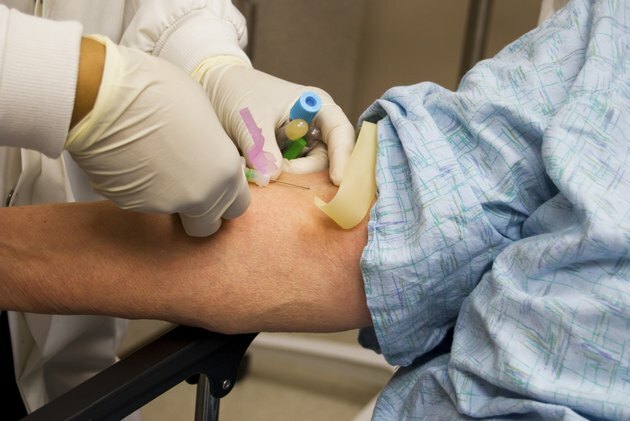 Louisiana State University indicates that blood tests are the most commonly used drug tests in medical settings, and the tests are routinely used to examine the presence of illegal drugs or used to check medication levels of patients. Blood testing is not routinely used to test for the presence of illegal drugs, since many test subjects may resist blood testing. This type of test is used as part of a legal investigation, such as testing for alcohol levels in arrested drunk drivers. What Drugs Will Show Up on a Hair Follicle Drug Test?